Dragon fruits usually consumed in the form of fresh fruit as thirsty reliever because it has high water level about 90 percent from its weight. This fruit also pretty sweet because sugar level reaches 13-18 bricks. Dragon fruit can be served as juice, fruit essence, candy or jam or various other serves as your taste. Generally, experts agree and admit that dragon fruit riches with potassium, ferum, protein, fiber, sodium and good calcium for health rather than other imported fruits. 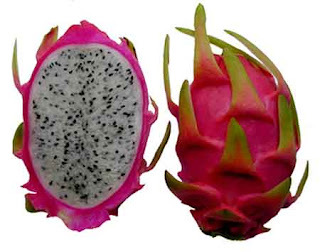 According to AL Leong from Johncola Pitaya Food R&D, an organization that researches red dragon fruit that honey cactus fruit riches enough with various vitamins and minerals to help increase body immune system and useful for body metabolism. Research showed that this red dragon fruit very good for blood circulating system, also gives effect to reduce emotion pressure and neutralize blood toxin. Research also showed that this fruit can prevent colorectal cancer, besides preventing high cholesterol level on blood and reduce fat level on body. For overall, every dragon fruit contains protein that can enhance body metabolism and take care heart health; fiber (to prevent colorectal cancer, diabetes and helps diet); carotene (eyes health, strengthen brain and prevent diseases), calcium (strengthen bones). Dragon fruit also contains iron to add blood; vitamin B1 (prevent body fever); vitamin B2 (enhance appetite); vitamin B3 (reduce cholesterol level) and vitamin C (add skin smoothness also prevent acne).